I set up my theremax with the volume antenna in the "controller" mode, so that volume decreases as you get further away (that makes more sense to me -- the instrument should be silent when not being played!). The problem is that there is now a heterodyning pitch sweep which also accompanies the volume hand movement, in addition to the main tone of the theremax. The secondary sweep is quiet but still annoyingly audible. Any suggestions for tuning that out? I can't find a position for the L3 slug which will eliminate it, unless I leave "controller mode" and go to the opposite sensitivity for the volume antenna (closer=quieter). It might just be a matter of need to go a bit farther with the inward adjustment of the slug for L3 for the volume tuning. The red regions include audio-frequency heterodyne, green post-audio. 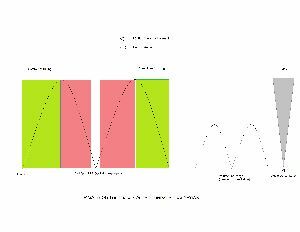 The topic "Theremax over the years -- updates to the circuit and tuning" includes tuning related details and images for referencing wire routing so as to avoid damping of the RF oscillator signals (and the resulting signal quality and CV range).